Anna-Laura Block runs a family-owned environmental business but her passion is volunteering. Thanks to her parents who role modeled the idea of community service, Anna-Laura has volunteered all of her life. When Anna-Laura joined the JLSA she truly felt empowered to take her humanitarianism further. She credits the Junior League with providing her the necessary skills to benefit the non-profits she has generously served. Anna-Laura remained active in the JLSA for over 15 years, completing her service as president in 2002-2003. She fondly remembers her active years and enjoyed serving on its Board of Directors for over 10 years, in addition to being the Community Council Chair and the last Waitress Chairman at the Bright Shawl. Shortly after serving the League, she joined the Board of Directors at the Battle of Flowers of which she has served numerous years and was the 125th Parade Chair. She simultaneously volunteered for the Animal Defense League ,of which she has been president for over 10 years, and is president of the Castle Hills Woman’s Club. 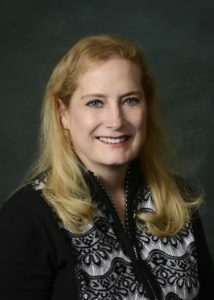 In 2011 she joined the Charity Ball Association and has served on its board and is currently the VP of the Rotogravure. She is on the Board of the Military Civilian Club and is currently serving a 3 year term on the San Antonio Area Foundation’s Animal Service Committee. Anna-Laura loves fiesta and began helping her parents at Niosa, in the Ranch Steak Booth, at the age of 4. She became a member of the Conservation Society, like her mother and grandmother, and continues her service to Fiesta San Antonio. In 2016 she served as the PMO representative to the Fiesta Commission as Battle of Flowers Parade Chair and was then elected to serve a 3 year term as an Elected Commissioner. Serving in other volunteer capacities, Anna-Laura was the Witte Society President, Chairman of the March of Dimes Celebrity Serve, was on the Committees for the Cattle Baron’s Gala and the San Antonio Zoo. Anna-Laura is married to Michael A. Block.